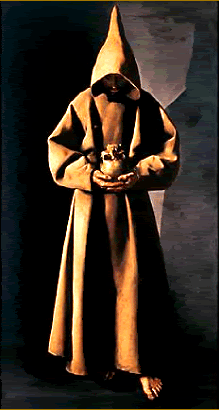 This martyr of the Franciscan Order was born at Chichester, England, in 1604. He was the only son of a devout physician, and received the name of Thomas in baptism. When he was eighteen years old, he resolved to become a priest and a missionary. At first he thought of going to the missions in the West Indies; but when it was pointed out to him later on that England was a preferable field for his labors, he gladly returned to his native land and there won the martyr’s crown. Because all the Catholic institutions had been suppressed in England, he first went to France, where with the consent of his zealous parents he studied at the Jesuit College at St Omer. About this time God filled him with a strong desire to enter the Franciscan Order. And so, when he was nineteen years old, he was invested with the habit of St Francis in the convent of Our Lady of the Ladder of Heaven in Valladolid, Spain, receiving the name of John Baptist. Blessed John Baptist Bullaker was ordained to the priesthood in 1628, and soon afterwards he was sent by his superiors as a missionary to England. On foot and without money, he set out on his journey. At Bordeaux he met the captain of a ship who volunteered to take him to England. The captain proved to be a traitor. As soon as they arrived in England, he turned Father John over to a magistrate. But Providence spared Father John for still greater things; for, unaccountably he gained his freedom. For fourteen years he then worked in secret, amid many hardships, persecutions, and dangers of all sorts. He undertook the task of comforting Catholics who had been imprisoned, strengthening them through the holy sacraments. In 1640 it was revealed to him that Blessed John Baptist Bullaker would die a martyr’s death. On Sunday, September 11, 1642, a maid in one of the houses in London where he was accustomed to say holy Mass in secret, betrayed him to an apostate for five pieces of gold. This man arrested him during the celebration of holy Mass and dragged him before a magistrate in London. Father John professed and defended his religion with great candor and invincible firmness, and so he was condemned to death. He was placed on a hurdle and dragged through the muddy streets to Tyburn, the place of execution. Unafraid, and filled with holy joy, the martyr mounted the ladder to the gallows. The sheriff then hanged Blessed John Baptist Bullaker, and while he yet breathed, the usual barbarous practice of quartering was inflicted on him. His heart, still palpitating, was shown to the crowd. Finally, his head was struck off and placed on a pole on London bridge, and the four pieces of his body on the four gates of the city. All this took place before a great crowd of people on October 12, 1642. In 1929 Pope Pius XI beatified Blessed John Baptist Bullaker together with one hundred and thirty-five other martyrs.